Unfortunately not seen while under sail, this impressive vessel had also been lying in the James Watt Dock for several days. She is the brand new superyacht CINDERELLA IV, seen heading on Sunday afternoon from Greenock to Dun Laoghaire. Designed by Tripp Marine, her hull - manufactured of carbon fibre - was built in Southampton and taken to Holland for fitting out at the Vitters shipyard. She is 39 metres in length, with an 8.4 metre beam, and is fitted out with four luxurious cabins forward for guests, and three cabins aft for her crew. 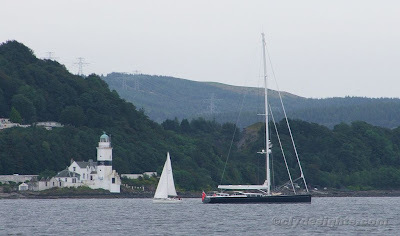 Her mast, dwarfing the smaller yacht seen on her port side, towers some 48 metres above her deck. A lifting keel is fitted to allow her to visit ports and harbours with strict draft limitations. CINDERELLA IV is due to be on display at the Monaco Yacht Show in late September.